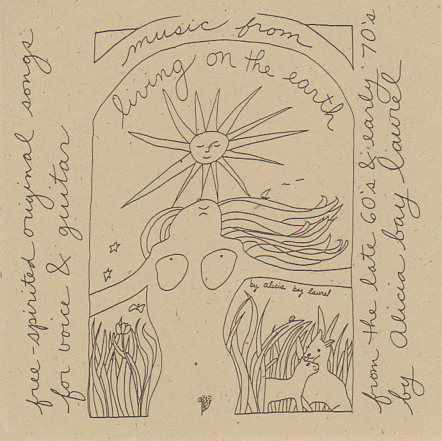 Posted on March 3, 2007 by Alicia Bay Laurel	in Blog. Thursday, March 1, I accompanied free software inventor and exponent Richard Stallman on a visit to the composer, musician, ethnomusicologist, humorist, philosopher, and musical instrument inventor and builder Kraig Grady at his home in Eagle Rock, Los Angeles, otherwise known as the North American Embassy of Anaphoria Island. (Anaphoria is the name of a medical condition inwhich the eyes look up.) “Everyone here is an exile,” noted Kraig, adding that, in the one and only article of the Anaphorian constitution, if you are harmonious with everyone and everything else on the island, you are thereby a native. Kraig produces a world ethnic music show on KXLU 88.9 FM in Los Angeles called The Wandering Medicine Show, specializing in music from traditions that regard music as medicine. It’s on Wednesdays from 8-9 p.m. Pacific Time, live streaming at kxlu.org. 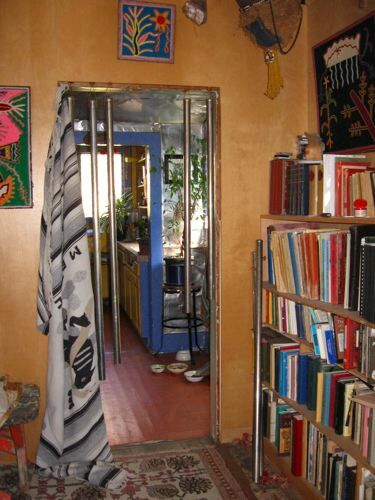 Naturally, his shelves bulge with music books, sheet music and recordings, and you can’t get through the kitchen door without inadvertently playing the hanging chimes. Richard Stallman and I are both world music fanatics, so we all listened to and traded recordings for a couple of hours. I came home with recordings of Inuit throat singing, Georgian choral music, a Ruth Crawford Seeger song of social commentary, songs from Latvia, Spain, and South India, plus three Anaphorian Island music CDs by Kraig Grady: The Stolen Stars, Beyond the Windows Perhaps Among the Podcorn, and Anaphoria: The Creation of the Worlds. An embarassment of riches! 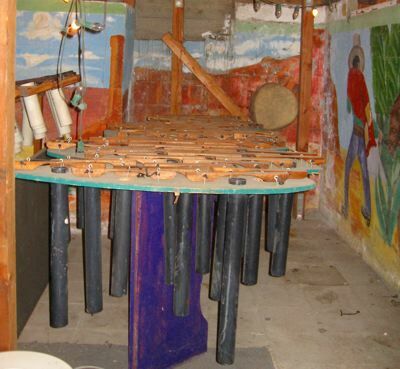 My favorite of his instruments is the bass vibraphone (also referred to as meru bars or low bars), with eight inch in diameter sections of PVC pipe as resonators. 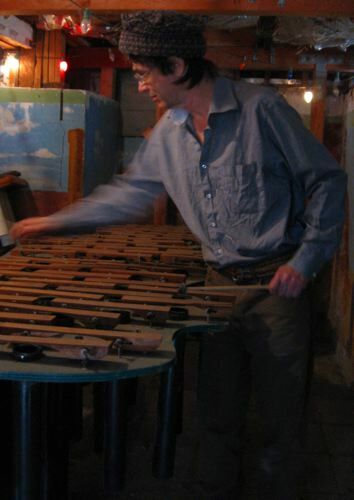 Kraig also takes existing instruments and modifies them to produce microtonal scales. The pitches of the vibraphone keys can be lowered by shaving off from under the center of the keys, and raised by shaving away at the ends, Kraig explained to me. 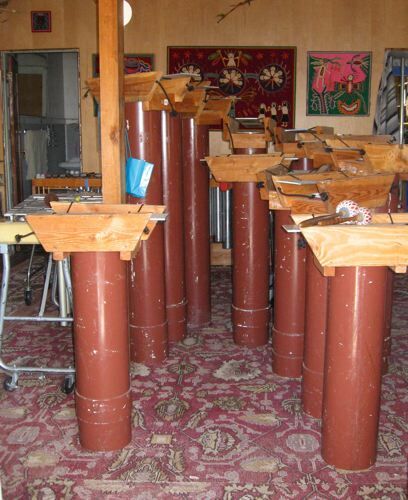 He has also retuned a small foot pump organ (larger than a medieval portative organ and smaller than a contemporary full sized organ), taking it out of well tempered tuning so that it can be played with the microtonal vibraphones. 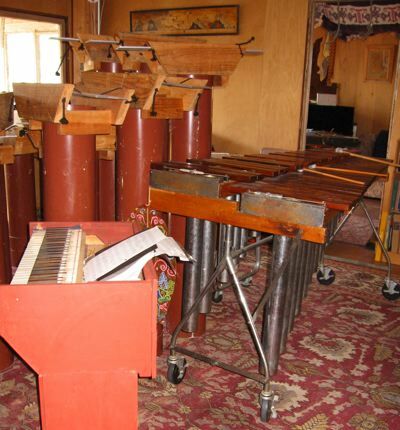 This vibraphone contains a twenty-two microtone scale, recalling the instruments of Harry Partch. Kraig performs not only his compositions on his instruments, but shadow puppet dramas which he writes, and for which he creates the puppets in traditional Indonesian style. Owing to the complexity of setting up these shows, he offers them once per year, at the end of May. 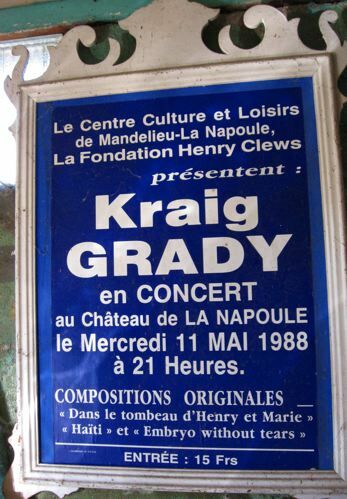 For a schedule of his performances, go to Kraig’s concert schedule page and email him to join his mailing list.